Apple has a message for you: Enjoy it while it lasts. Well, Apple didn’t actually say that—not specifically, anyhow. But that was the bottom line of a tech note on “unsupported third-party digital media” posted by Apple on Tuesday. While acknowledging that “some third-parties claim that their digital media players are able to sync with Apple software,” Apple would like to remind everyone that such capabilities are—like the beauty of youth, glory, and ice cream under the hot summer sun—fleeting. Apple does not provide support for, or test for compatibility with, non-Apple digital media players and, because software changes over time, newer versions of Apple’s iTunes software may no longer provide syncing functionality with non-Apple digital media players. The benign interpretation of this note is that Apple is simply given Pre owners a friendly warning that while their non-iPhone/non-iPod devices are syncing up with iTunes just fine now, that may not always be the case. And, if and when an update comes along that happens to break that functionality, well, don’t come crying to us. Apple, after all, has a bit of a history when it comes to making good on warnings about unsupported functionality that may or may not go the way of the dodo. In September 2007, Apple issued a warning to iPhone users who were unlocking their phones with third-party hacks that future software updates might render their “jailbroken” iPhones inoperable. Within a week, the iPhone 1.1.1 update did exactly that—leaving jailbroken iPhone users who downloaded the update with the most stylish-looking bricks in town. 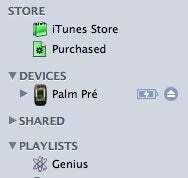 So take note, Palm Pre owners—that next iTunes update could be a doozy.